• Why a Photoshop plug-in for Axialis CursorWorkshop? A plug-in is a program extension module. In fact, this is a small program which is "plugged" (added) into another application to enhance it or add a new feature to it. The plug-in must be compatible with the "parent" application specifications. Adobe created a powerful plug-in interface for Photoshop. This plug-in model is now a widely used standard in the graphical industry. As a result, a Photoshop compatible plug-in can also be used with various other graphical applications (Illustrator, Paint Shop Pro...). Why a Photoshop plug-in for Axialis CursorWorkshop? We created such a plug-in to permit you to transfer an image or a drawing directly from Photoshop (or any plug-in compatible application) to Axialis CursorWorkshop through the memory. This is much more fast and secure. No more temporary PSD or PNG file to transfer your image into Axialis CursorWorkshop. No more risk to loose your file while transferring it. Before using this plug-in you have to install it in the Photoshop plug-ins directory. 1. Axialis CursorWorkshop supports the native Photoshop PSD image format with Layers. In Photoshop save your image to a PSD file. 2. In CursorWorkshop, choose "File/Open", browse your folders and select your file (Windowsstandard dialog box). 3. The image file opens in a document window. If the image contains layers, you see them on the left side of the document window. You can select one layer by clicking on it. Its contents appears automatically in the main area. Now you can create a static cursor from this image or create an animated cursor from this image. 1. 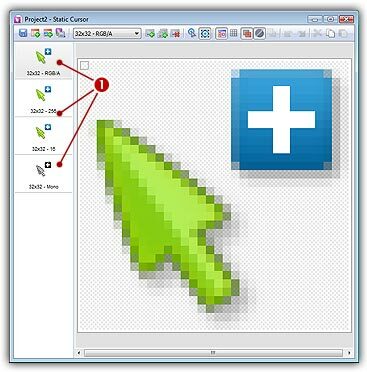 Open an cursor in CursorWorkshop. Select the desired image format by clicking on it. It appears in the editor window. 3. A standard Save Image As dialog box opens. In the Save as Type list, select "Adobe Photoshop (PSD)". Choose a destination folder and type a new filename. When done, click OK. The file has been created. 4. In Photoshop, open the newly created file. It opens, containing one layer with transparency. Now you can retouch it or use it as necessary. Before using the plug-in as detailed in next topic, you need to install it on your computer. The plug-in can be easily installed from within Axialis CursorWorkshopä in one fast and simple operation. 2. 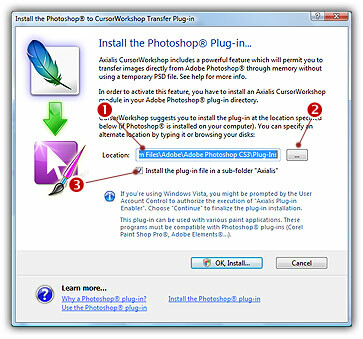 The dialog box Install the Photoshop to CursorWorkshopTransfer Plug-in opens (see below). In the Location edit zone ( ), specify the Photoshop plug-in folder. If you don't know the exact folder path, click the browse button ( ) to choose the folder in a list. 5. Now you can start your Photoshop application. The plug-in is visible in File/Export/Export to Axialis CursorWorkshop menus. 1. First of all, launch Photoshop and open or create an image file. You don't need to launch Axialis CursorWorkshopbefore using the plug-in. It will be automatically launched by the plug-in if necessary. 2. 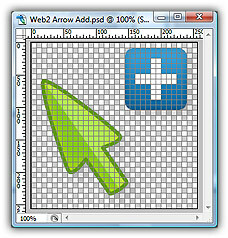 For example, open the file located in the Librarian "Cursors\Tutorials\Web2 Arrow Add.psd". 3. 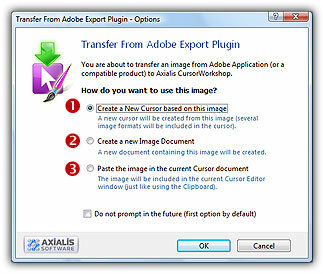 Export the image: Choose the File/Export/Export to Axialis CursorWorkshop in the Photoshop menu. 5. The image is about to be transferred in Axialis CursorWorkshop. 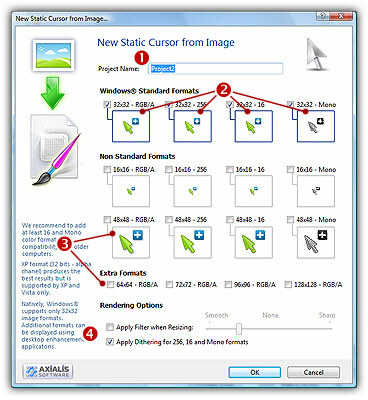 You can choose one of the following operations: Create a New Cursor using this Image ( ): You create a new cursor with several formats based on the image (see step 4); Create a New Image Document ( ): CursorWorkshop opens a new document containing the image. You'll be able to perform various operations on the image (resize, crop, save...) and even create a new cursor from a portion of it; Paste the Image in the Current Cursor Document ( ): This option is enabled only if a cursor document is already opened in CursorWorkshop. It pastes the image in the current editor area (just like the Clipboard paste operation). 7. 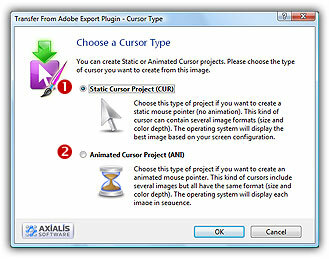 If you choose Static Cursor Project (CUR), the following dialog box opens. The procedure is similar for creating Animated Cursors.